Motion Controllers in the MC-X100 series are ISA compatible and designed around the Agilent Technologies HCTL-1100 Motion Control Processor. The MC-X100 series provides two position control modes and two velocity control modes. The MC-X100 provides for control of DC brush type, DC brushless and stepper motors. Commutation, phase, phase overlap and phase advance may be programmed in the MC-X100 series controller. The MC-3100 3-axis version provides eight digital inputs and eight digital outputs. Four of each are optically isolated, the reamining four are TTL. The MC-1100 single axis version, provides four inputs and four outputs, of which, two inputs and two outputs are optically isolated. The MC-1100 single axis controller is a half size ISA computer board. The MC-3100 three axis controller is a full size ISA computer board. The MC-3100 provides three axes of closed loop independant axis motion control. With additional software, it supports multi-axis coordinated motion control. All that is required to construct a single or multi axis closed loop servo system is a computer with an available ISA slot, an MC-X100 with optional cable and connector board, the appropriate number of servo motor power amplifiers, servo motors with incremental encoder and a motor power supply. 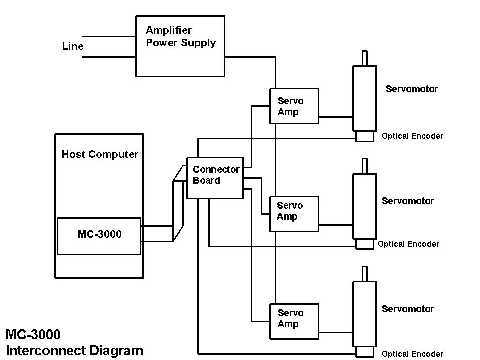 These components and their basic interconnection for a three axis application are shown in the diagram below. The MC-X100 series has 24 bit resolution for position, 16 bit resolution for acceleration and 8 bit resolution for velocity. Four control modes are provided by the MC-X100 series, Proportional Mode, Integral Velocity Mode, Position Mode and Trapezoidal Profile Mode. Loop update time is programmable and can be as short as 64 microseconds. This allows small variations in velocity and acceleration to be programmed for effective trajectory control for contouring at high speeds. Additionally the the MC-X100 series provides an industrial quality incremental encoder interface with differential or TTL level inputs and noise filtering. A generous number of uncommited digital I/O is provided for sensing limit switches, for control of amplifier enables or other user functions. Closed loop high performance motion control for 1 or 3 axes (depending on model), with position and velocity control of DC brush, DC brushless and Stepper motors. Programmable digital compensation filter, with gain, pole and zero. Programmable loop update time from 64 micro seconds to 2.048 milliseconds. Programmable position and velocity control profile with velocity and acceleration limits. 20 KHz PWM output, pulse and sign. 4 digital outputs, 2 optically isolated, 2 TTL (MC-1100). 4 digital inputs, 2 optically isolated, 2 TTL (MC-1100). High Speed Interface to PC uses only five registers in PC I/O address space(MC-3100). Register write time, 1 microsecond. Register read time, 2.1 microsecond. The MC-3000 package includes the MC-3000 3-axis motion controller board and a CD with instruction manuals and software for the MC-3000. The MC-1100 package is a kit which includes the MC-1100 motion controller board, CD with software and manuals, cable and connector board. Options include cables (MC-3000CA), a connector board which provides for screw terminal connections (MC-3000CB), and software for multi-axis control (MA-3000SW). The MC-1100 is sold as a kit which includes cable and connector board.